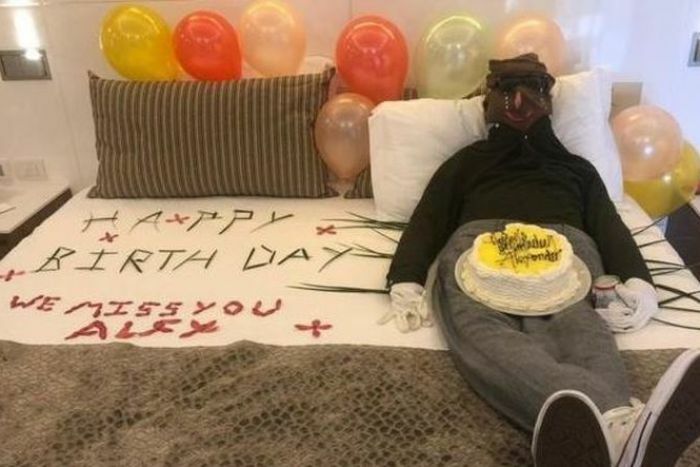 A UK couple have been refunded the cost of their five-star holiday in Jamaica after an effigy of their dead son was created in their hotel room. Karen Baker asked staff at Royalton Jamaica Resort to decorate the room her friends, Faye and Andrew Stephens, were staying in. The Stephens made the trip to honour their late son Alex’s birthday, something they made a tradition of after he died in 2014, so Ms Baker asked for a cake and some balloons to be put in the room. The staff obliged, but went far beyond the request. They arranged a long-sleeved top, a pair of trousers, sneakers and gloves on the bed and stuffed them with towels to make the outfit look like a body. Next to the effigy were the words “we miss you Alex” written in flower petals. The dummy’s “hand” was clutching a beer can, while the staff arranged tears running down its face. Ms Baker found the dummy before the Stephens could see it. The couple were refunded their $2,300 per person holiday after Ms Baker complained about the experience on BBC’s Three Counties JVS radio show, saying she had been “utterly horrified”. “I have truly never seen anything like it,” she said. A spokesperson for TUI UK, the British-based travel operator that runs the hotel, apologised to the family. “We’re following up with the hotel and believe it was a misunderstanding with no intention to cause upset,” the spokesperson said.